After a week in Tasmania, supposedly the most wildlife-packed state in Australia, without seeing anything besides ducks (mostly mallards) and songbirds (mostly sparrows and starlings), I was getting desperate. 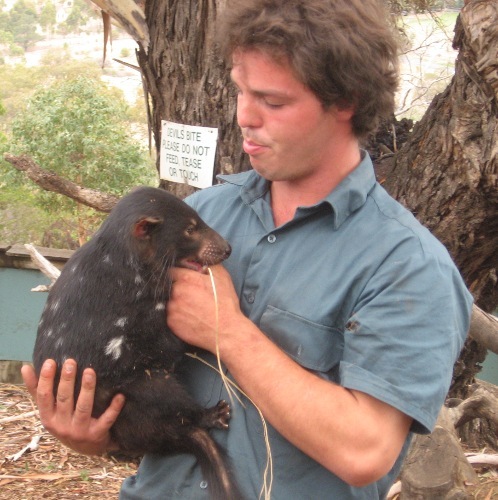 I had one last hope: Bruny Island, touted as the wild and unspoiled place to see wildlife ... though the wildlife touted in the tourist brochures mostly seems to involve paying for a boat ride to see sea birds and fur seals. 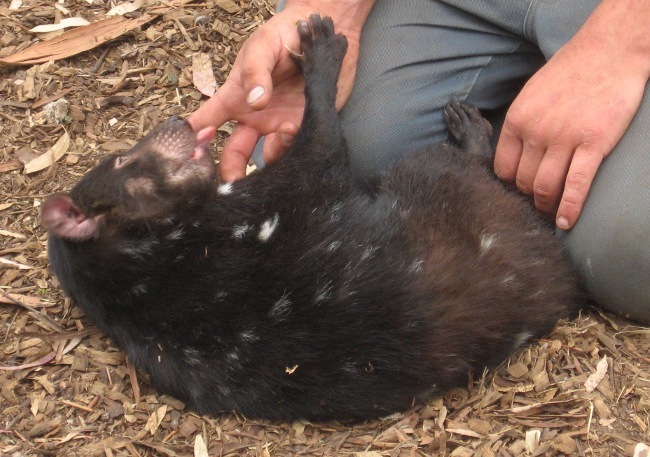 Nobody ever talks about marsupials wandering around -- are there any? Since it's an island, how would they get there? Nobody ever mentions the intriguing spot marked "penguin rookery" on "The Neck" between North and South Bruny. After last year's tremendous experience at the Philip Island Penguin Parade, I thought it might be worth booking a room on Bruny in the hope of seeing (a) penguins and (b) other nocturnal wildlife. We booked into the "Bruny Island Hotel", a tiny pub with two lodging units billing itself as "Australia's Southernmost Hotel" (a claim dubious claim -- we saw plenty of lodging farther south, though their actual names didn't include the word "hotel"). We were a little taken aback when we saw the place but it turned out to be clean and comfortable, and right on the bay. And the pub had some wonderful aromas from the daily curry special (which, we found that night, tasted as good as it smelled). After that our appreciation of the scenery declined a bit as we kept our eyes glued to the trail ahead of us, but we saw no more snakes and eventually emerged into a clearing that gave us great views of a radio tower but no views of much of anything else. On Mt Mangana, the journey is the point, not the destination. On the way back down, when we got to the rocky clearing, both of our colubrid friends were there to meet us. Dave, in the lead, stamped a bit and the larger snake slithered off ahead of us on the trail -- not quite the reaction we'd been hoping for -- while the smaller snake coiled into a ball but remained off the trail. Eventually the large snake left the trail and Dave quickly passed it while I snapped a shot of its disappearing tail. Now it was my turn to pass -- but the snake was no longer visible. Where was it now? I was searching the trailside where it had disappeared when I heard a rustling in the bush beside and behind me and saw the snake's head appearing -- it had circled around behind me! (I'm sure this wasn't a strategic move, merely some sort of coincidence: I used to keep snakes and though they're fascinating and beautiful, intelligence isn't really their strong point.) I high-tailed it down the trail and we finished the walk safely. That evening, we headed over to the penguin rookery, where it turned out that we had happened to choose the one night when there was a ranger talk and program there. I wasn't sure whether that was a good or a bad thing, since it meant a crowd, but it turned out all to the good, partly because it meant a lot more high-powered red-masked flashlights to point out the penguins, but mostly because the real show there isn't penguins at all. The Bruny Island penguin rookery is also a rookery for short-tailed shearwaters -- known as "muttonbirds" because they're "harvested" for their meat, said to taste like mutton. Their life cycle is fascinating. They spend the nothern hemisphere summer up in the Bering Sea near Alaska, but around September they migrate down to southern Australia, a trip that takes about a week and a half including stopping to feed. They breed and lay a single egg, which both parents incubate until it hatches in mid-January. Then the parents feed the chick until it grows to twice the size of its parents (some 10 kg! while still unable to fly). Then the parents leave the chicks and fly back north. This is the stage at which the overgrown chicks are "harvested" for meat. The chicks who don't get picked off (they're protected in Tasmania) live off their fat deposits until their flight feathers come in, at which point they fly north to join the adults. We were there about a week after hatching, while the parents were feeding the chicks. The adult shearwaters spend all day fishing while the chick sleeps in a burrow in the sand. At sunset, the adults come flying back, where they use both voice and vision to locate the right burrow. The catch: a bird that migrates from Alaska to Tasmania, and takes casual flights to Antarctica for food, is designed to fly fast. Shearwaters aren't especially good at landing in confined spaces, especially when loaded with fish. The other catch is that there are many thousands of them (the ranger said there were 14,000 nesting at that rookery alone). So, come dusk, the air is filled with thousands of fast-flying shearwaters circling and looking for their burrows and working up the nerve to land, which they eventually do with a resounding thump. They crash into bushes, the boardwalk, or, uncommonly, people who are there to watch the show. It's kind of like watching the bats fly out of Carlsbad caverns ... if the bats weighed five kilos each and flew at 20-30mph. The night fills with the eerie cries of shearwaters calling to each other, the growling of shearwaters fighting over burrows, and the thumps of shearwaters making bad landings. Penguins? We saw a few, mostly chicks coming out of their burrows to await a food-carrying parent, and late in the evening a handful came out of the water and climbed the beach. Penguins normally find each other by sound, and at Philip Island they were quite noisy, but at Bruny most of the penguins we saw were silent (we did hear a few penguin calls mixed in with the cacophony of shearwaters). But we didn't really miss the penguins with the amazing shearwater show. When we finally drove back to the hotel, we drove slowly, hoping to see nocturnal wildlife. We knew by then that Bruny does have mammals (however they might have gotten there) because of the universal sign: roadkill. And we did see wildlife: three penguins, two small red wallabies, three smaller red animals with fuzzy tails (ringtailed and brushtailed possums?) and one barely-glimpsed small sand-colored animal the size and shape of a weasel (I wonder if it could have been a brown bandicoot? 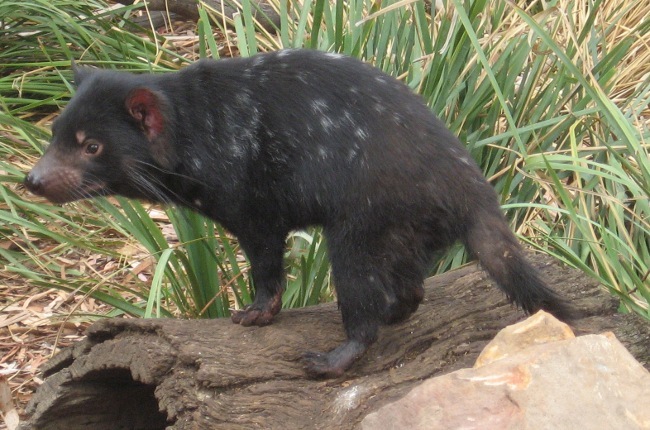 It didn't look mouselike and didn't have spots like a quoll).